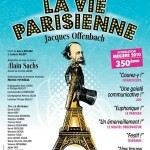 Co-produced by Alain Sachs and the Théâtre Antoine, Paris. Directed by Alain Sachs. Musical Director: Patrice Peyrieras.